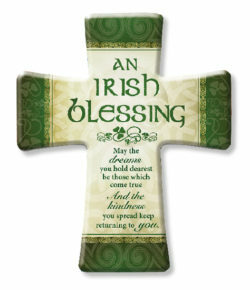 A glazed porcelain Irish Blessing cross . this cross is freestanding or can be hung. Measurements are 5 3/4″ x 4 3/4″. Message reads: May the dreams you hold dearest be those which come true And the kindness you spread keep returning to you.